Cat Haven is Western Australia's premier cat welfare organisation. It is an open admission cat shelter which will never turn away a cat, no matter how old or sick. Being a not-for-profit organisation means they rely heavily on donations to keep all the cats fed and healthy while finding them a fur-ever home. Over 8,000 cats are surrended to Cat Haven every year. "Casey from Grand Cru is efficient and so helpful! 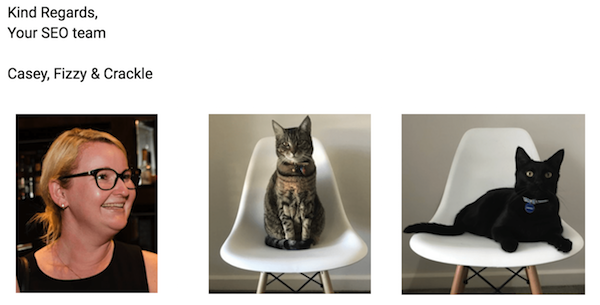 She helped us optimize our website at Cat Haven and walked us through what everything meant and how to complete each stage, resulting in a highly optimized site. She was also able to help apply for our Google Adwords grant and apply the grant so we now have our site showing right at the top of Google search pages. Fantastic service, great result -so happy and highly recommend." I am a self-confessed crazy cat lady. I think my About page kind of gives that away. We adopted our 2 fur babies 5 years ago, however, giving a home to only 2 rescue cats has never been enough for me. While living in Perth, I became a huge advocate of the work Cat Haven is doing to give every cat a chance to find a loving home and I wanted to help as much as I could. When I branched out on my own to start Grand Cru Digital, knowing I'd have some extra time up my sleeve whilst I build up a portfolio of clients, I really wanted to put my time to good use. Therefore I reached out to the team at Cat Haven to offer them my Premier Cru SEO package, pro bono. Alongside investigating whether we could acquire a Google Ad Grant (aka free Google advertising) for Cat Haven. Then team at Cat Haven were super excited that I approached them, claiming that it was something they have wanted but have never had the funds to do it. The aim of the project was to provide Cat Haven with SEO recommendations they could action to optimise the website. These recommendations would help get more visitors to the website who will adopt, donate, foster and support Cat Haven. Alongside improving the usability of the website and how Cat Haven looks on the search result pages. • Asked Cat Haven to fill in our full briefing document so that I fully understood the business and their goals. • Conducted thorough keyword research for the key pages on the website to find out exactly what terms people are searching for to find organisations like Cat Haven. It was really important for me to clearly explain my recommendations and why they are important so that Cat Haven can continue to optimise their website on an ongoing basis. It was a brilliant project to work on and the GCD Meow-keting Manager, Fizzy and Cat-mmunications Office, Crackle thoroughly approved! While we were working on the SEO project we also looked into Google Ad Grants. If you're an eligible non-profit organisation, Google will provide you with $10,000 of free Google AdWords advertising per month. It's an amazing opportunity for charities like Cat Haven to help drive more donations and support for their cause. The thought of being able to acquire Cat Haven $10,000 per month of free online advertising made my heart swell. I have never had the opportunity to apply and go through the process of setting up a Google Ad Grant, so from a career development perspective, I was very excited. So what did GCD have to do? • Submit an application to Google once Cat Haven had set up a TechSoup account. • Set up a new Google AdWords account and create our campaigns and ads according to Google's ad grant policies. And that was it! I submitted the application on a Monday afternoon and by Tuesday afternoon the account was up and running! I'm not going to lie, there were some happy tears when I found this out. In terms of ongoing maintenance, I will be optimising the campaigns and ads based on performance weekly to ensure the account stays within Google's ad grant guidelines and Cat Haven remains eligible for $10,000 every month. Happy Friday Everyone ? . The Grand Cru Digital CFOs (aka chief furry officers) have been working hard on a very special #SEO project over the last couple of weeks. More details to come on the blog next week ?